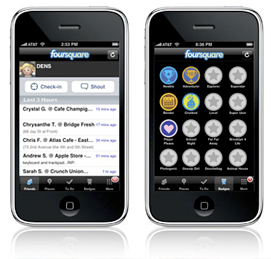 Foursquare is growing fast. Real fast. Traffic may be up as much as threefold over the past two months. But how are people actually using it? The main Foursquare account tweeted out stats today that give a nice breakdown of usage. It’s just over a seven day span, but given that the service is now finally on platforms such as BlackBerry, is probably a good sample. As you may expect, the iPhone still dominates, with 67% of usage. Coming in second with 13% is Android, which was the second native app Foursquare launched. In third is the just-launched BlackBerry version with 11%. In fourth is the mobile web, which has 7%. Palm is in fifth with 1.5%, and SMS comes in last with less than 1%. A few interesting things to note: When the service launched just about a year ago at the SXSW festival, it was iPhone and mobile web only. Whoever wrote the tweet on the Foursquare account added “still?! ?” when noting the mobile web’s 7% usage, so clearly they think there are better options out there. And with the just unveiled Windows Mobile client, there are now apps for all the big platforms except for Nokia (which is also in the works). Also interesting is that SMS is in last place on this list with less than 1%. Foursquare is similar to co-founder Dennis Crowley’s last startup, Dodgeball, which sold to Google in 2006 — but the difference is that Dodgeball heavily relied on SMS. It’s interesting that Foursquare is seeing the growth it is in spite of this lack of SMS usage. SMS was a big reason why Twitter exploded, and it still is a major part of the service in other countries. That’s something Foursquare might want to consider as it continues to expand.